As rock music becomes more entrenched as part of not just popular culture but mainstream history, major exhibitions devoted to iconic artists are becoming more common. Recent years have seen touring exhibitions devoted to the Rolling Stones and David Bowie, and a big one on Pink Floyd is at London’s Victoria & Albert Museum until October 1. I won’t be able to make that unless something unexpected develops. 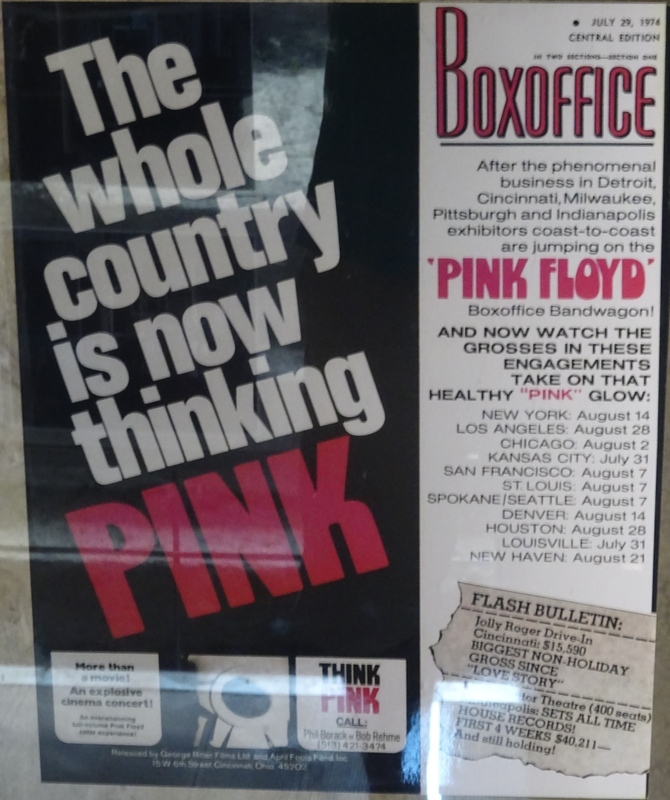 But I did, to my surprise, see a much smaller but worthwhile exhibit on Pink Floyd’s October 1971 performances for the Live at Pompeii movie when I visited Pompeii for the first time in early July. Poster for the Pink Floyd Live at Pompeii movie, early 1970s. The Live at Pompeii movie is not a universal favorite among rock and film critics, some of whom find it (and the cutaways to brief interviews and scenes of the band in the recording studio) on the pompous side. Pomp is certainly appropriate for a movie made in a site that starts with the letters “Pomp,” though, and you have to admire the chutzpah of a group (and director, Adrian Maben) who somehow commandeered the amphitheater of the legendary excavated city for a concert documentary. 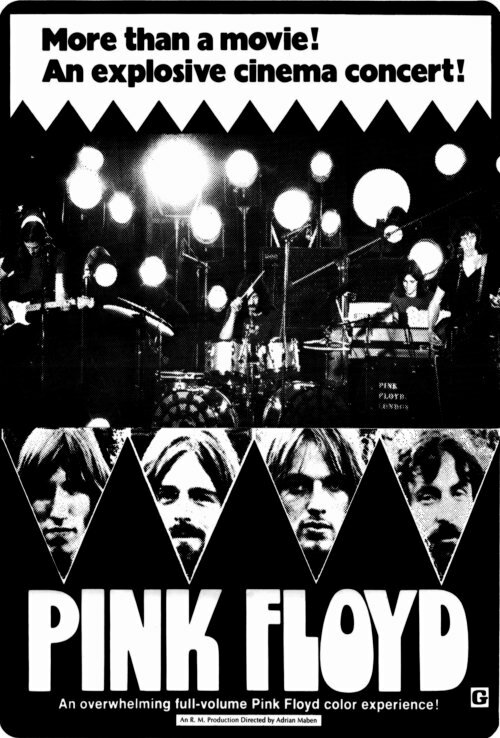 Of most significance, it captures the Floyd performing a good cross-section of material from the late 1960s and early 1970s in an impressively exotic, haunting setting. What’s more, they opted not for the usual concert doc with cuts to rabidly enthusiastic fans, but for a show without an audience — or so they thought (more on that later in this post). 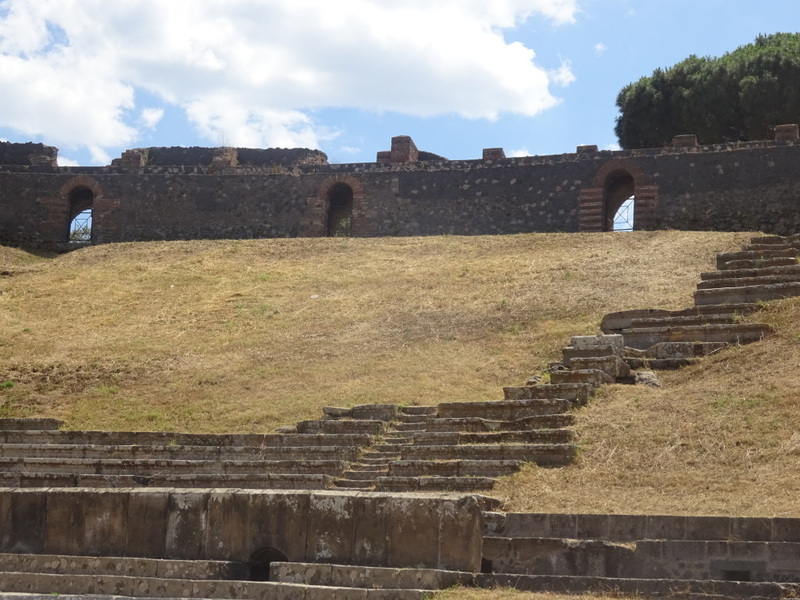 The Pompeii amphitheater where Pink Floyd played in October 1971, as it appears today. 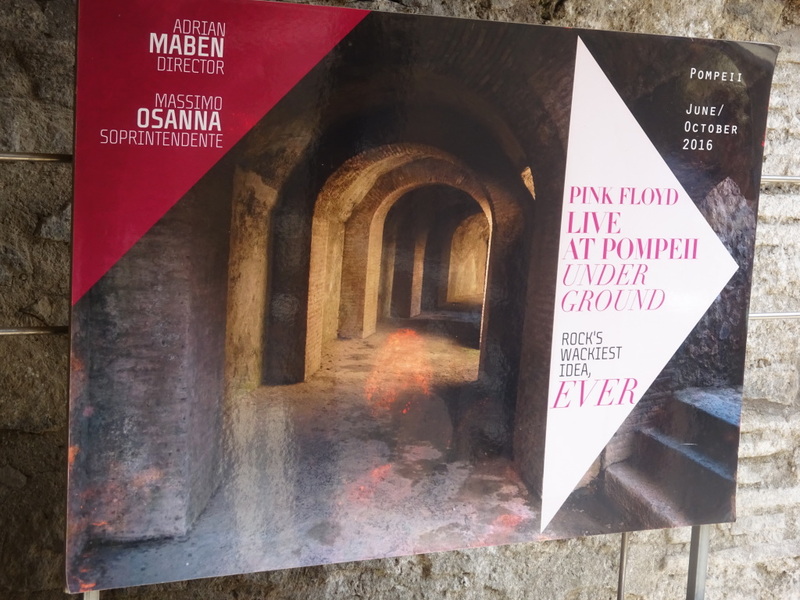 So that would have been that, except to my surprise, there was a substantial exhibit on Pink Floyd’s Live at Pompeii performances in the underground passages near the entrance. I hadn’t heard about this at all in the media, and it’s still hard to find out much about it online. 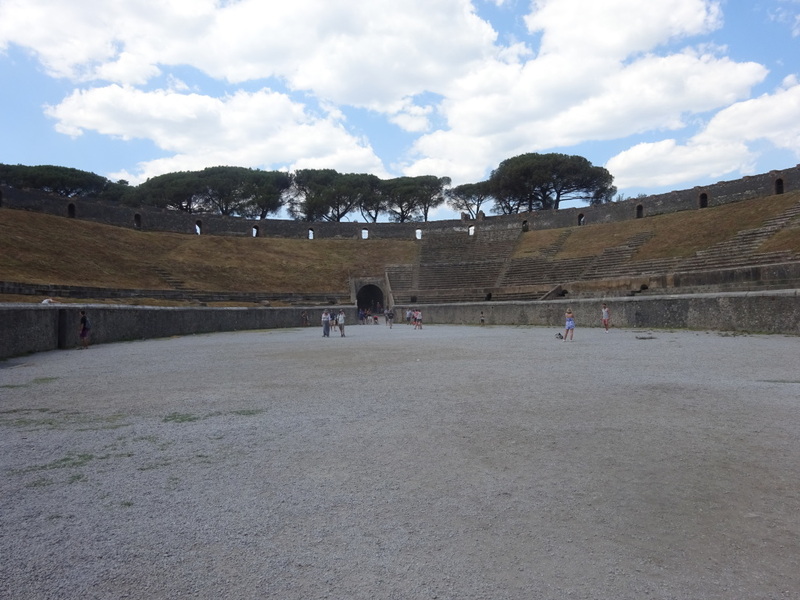 I did learn that this was first staged in Pompeii’s town hall during most of July 2015, and then moved to the amphitheater when Floyd guitarist David Gilmour played two shows there in July 2016. I still can’t determine how long the exhibition will run. Although there weren’t huge numbers of people at the exhibit, the underground space is small enough — maybe a few dozen meters to either sides of the entrance, with just a few feet between the two walls of material — that it’s not always easy to comfortably view and see everything, even when there are just a few dozen people. Also, some of the displays — such as some of the ones showing scenes from the Live at Pompeii movie or playing Pink Floyd recordings — will be familiar to serious Floyd fans. However, there were some off-the-beaten track items and info, which I’ll focus on in this post. There are quite a few photos, some taken by French cameraman Jacques Boumendil. 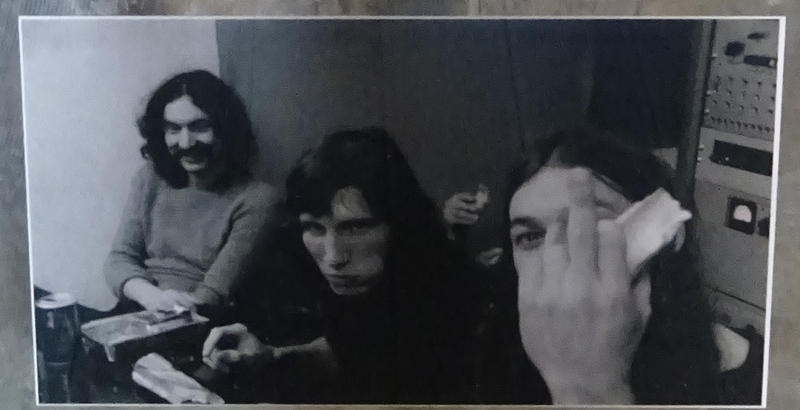 There are also some stills from Chit Chat with Oysters, a recently rediscovered December 1971 16mm Maben film of the Floyd doing overdubs for the soundtrack at the Europasonar studio in Paris. Still from Chit Chat with Oysters, finding David Gilmour in a particularly merry mood. 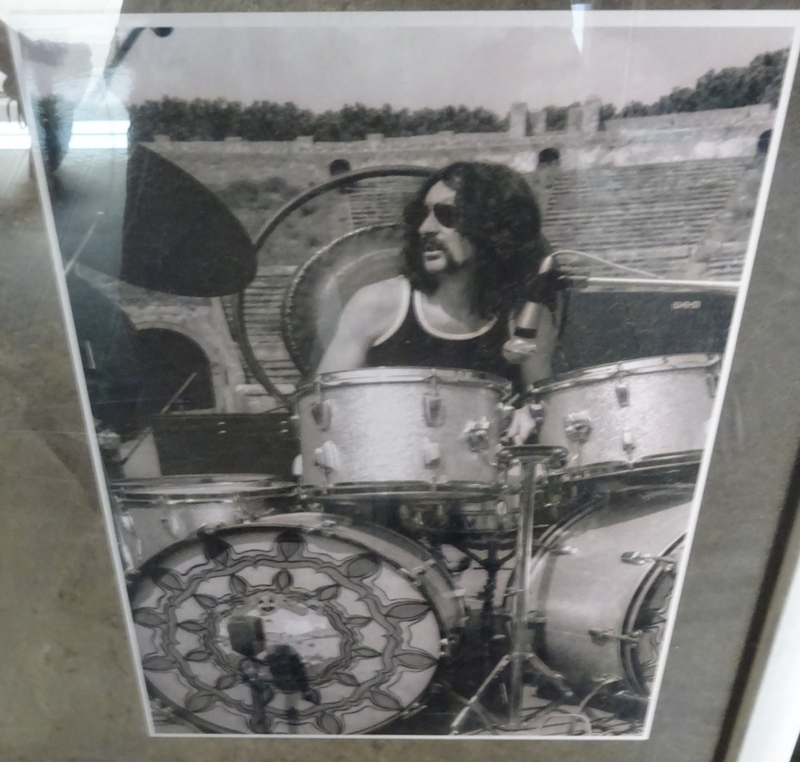 Nick Mason performing at Pompeii, photographed by Jacques Boumendil. “Live at Pompeii was conceived as an anti-Woodstock film. 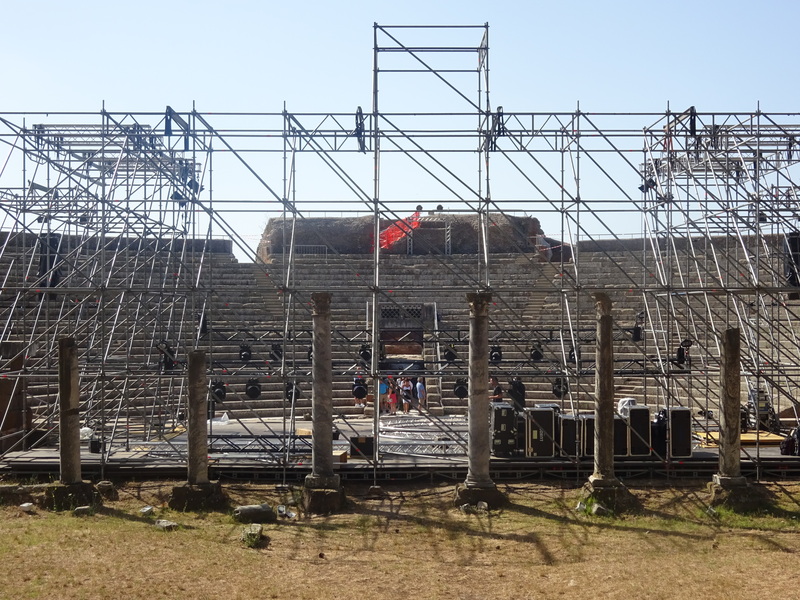 The amphitheater was supposed to be completely empty except for a handful of technicians, roadies and the French Italian camera crew. But when I returned to Pompeii in 1999 for the [DVD director’s cut] I met a group of adult men in their mid-[forties]. They told me that as teenagers they had skipped school and gate-crashed the amphitheater to watch the Pink Floyd concert. They remained hidden near the open windows on the upper floor of the amphitheater. Teenagers who gate-crashed the Pompeii concert, back then (top) and in recent years (bottom). As an aside, even though this happened more than 45 years ago, it’s hard to imagine a time when you could gate-crash a concert filming by a major band in this fashion. Pink Floyd weren’t nearly as big as they’d be when 1973’s Dark Side of the Moon became one of the all-time best-selling albums, but they were already pretty big — more so in Europe than in the US. 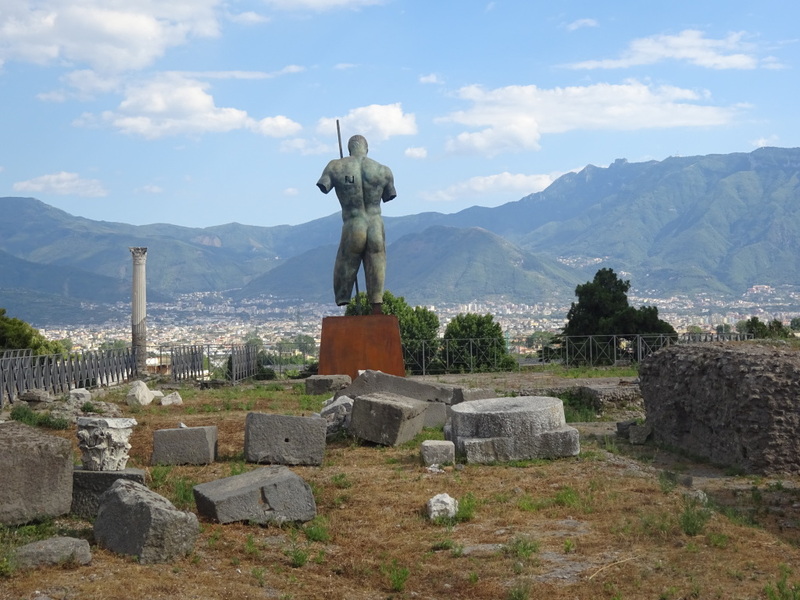 Now that Pompeii welcomes two-and-a-half million paying visitors a year, it’s also hard to imagine a time when you could just slither in and play in the ruins. 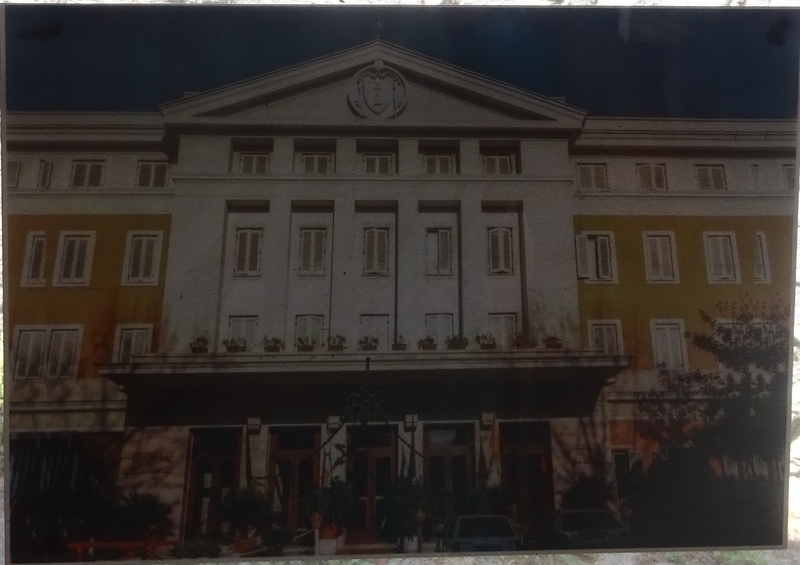 The Gran Rosario Hotel, as it appeared when Pink Floyd and film crew stayed there in 1971. “After a clash with the Floyd about their daily expenses, I told them that I was not going to pay their daily cannabis and other substances because it was not my responsibility. But I think they were joking, it was probably just for fun. “Above all I remember the magic night shoot of ‘One of These Days I’m Going to Cut You into Little Pieces’ with the drummer Nick Mason who was by far the most approachable of the four members of the band. I often dream at night, even now 45 years later, about the Floyd and the music they played in the amphitheater. 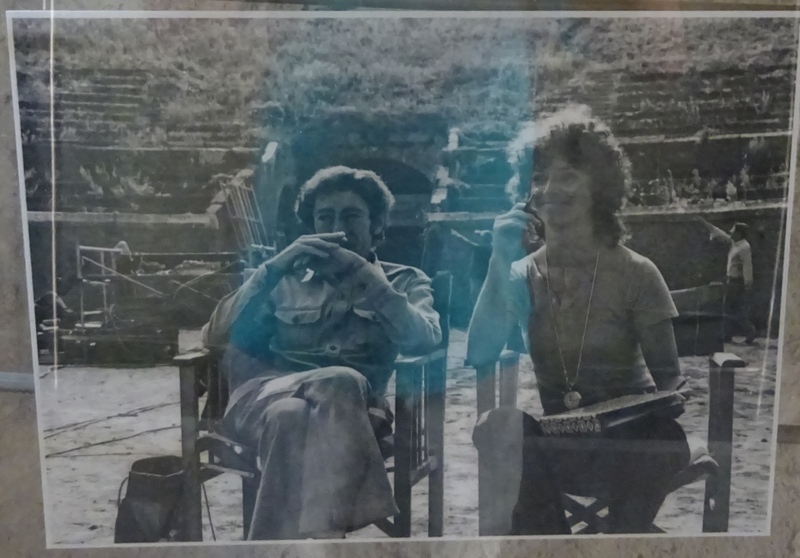 Especially ‘Echoes’ and ‘One of These Days’…The moon was shining, the ruins were mysterious and there was that strange slow dance of the 35mm cameras that took place during the circular tracking shots. Script girl Marie-Noelle Zurstrassen on the set with director Adrian Maben, photographed by Jacques Boumendil. Elsewhere in Pompeii, taken the day of my visit. 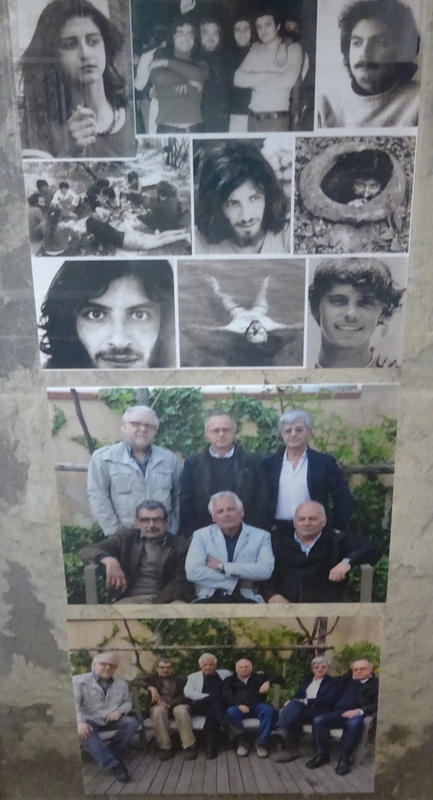 The last day of my nearly month-long visit to Italy (actually mostly spent in Sicily), I stumbled across another Pink Floyd event of which I was unaware. 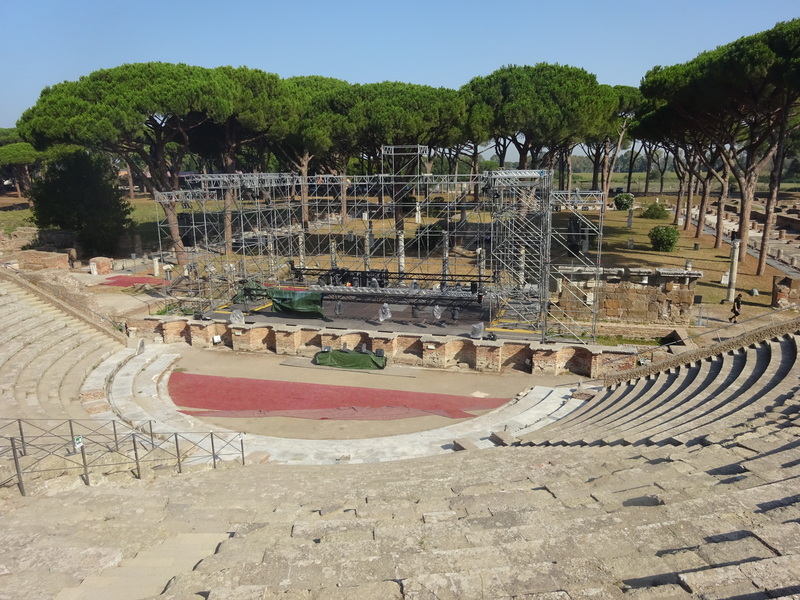 In the amphitheater of the ruins of Ostia Antica near Rome, a tribute concert was being staged to their 1970 album Atom Heart Mother. As the poster below notes, this would include the kind of orchestral and choral arrangements featured on the original LP (though no actual musicians from Pink Floyd were involved). 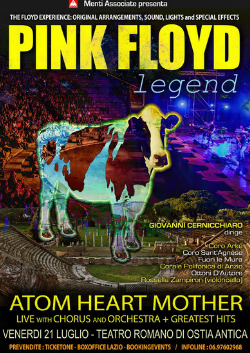 Pink Floyd did play Atom Heart Mother material in concert with a choir and orchestra. On their recent mammoth Early Years 1965-1972 box set, you can see a 21-minute version of “Atom Heart Mother” itself that they performed with the Philip Jones Brass Ensemble and the John Alldis Choir, filmed in London’s Hyde Park on July 18, 1970. Twenty-first-century technology no doubt makes this sort of combo easier to pull off onstage, though it arrived decades too late for Pink Floyd to take advantage of it in their prime.